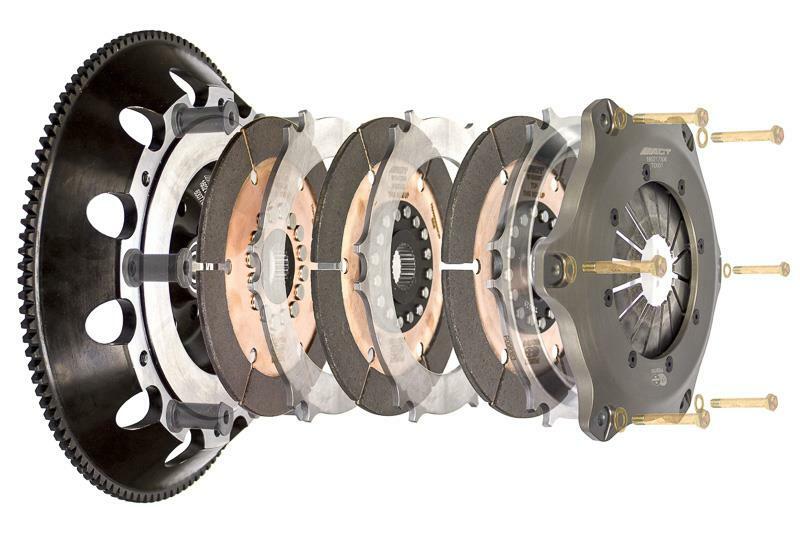 Race proven through ACT’s involvement with some of Formula Drift’s top drivers, ACT now offers a bolt-in 7.25” race triple-disc clutch kit for the Toyota 2JZ-GTE engine with G-force transmission. This triple-disc clutch kit features a pressure plate, three sintered iron discs, a XACT Prolite flywheel, and pilot bearing. With ACT’s ability to design and manufacture diaphragm springs, the ACT Research & Development team was able to keep the pedal effort light, while greatly increasing torque capacity. The sintered iron discs allow for quick shifting and provide extra surface area for high-heat capacity and long life. This kit can support up to 1685 ft.-lbs. of torque at the crank. The XACT Prolite flywheels are a one-piece Chromoly construction with machined slots to provide the lowest inertia and best throttle response. In addition, ACT’s XACT flywheels can be cost-effectively resurfaced.